Dogwood trees covered with white blossoms are one of the first signs of spring in Texas. These small, low-branched trees also are grown for their bright-red fall berries, a favorite of birds, squirrels and deer. The best time to plant your dogwood tree in Houston, Texas, is late fall, after the tree has gone dormant. The International Society of Arboriculture and Trees for Houston reports this will give the tree time to become established before hot summer weather arrives. 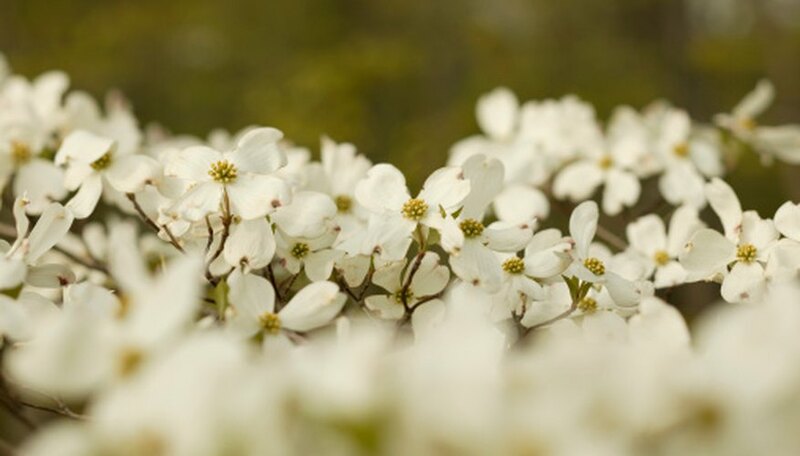 Plant your dogwood in well-drained sandy or loamy soil with a slightly acid pH, ranging from 5.0 to 6.5, advises the University of Florida Extension. If your soil is heavy clay or consistently wet, plant your dogwood in a raised bed to keep its roots dry. Dogwoods will grow in sun or shade, but trees grown in Houston should have partial shade in the afternoon. Too much shade will cause your tree to be less dense and have poor flowering and fall color. If your soil is sandy or loamy, plant your dogwood in a hole only as deep as its rootball. If your soil is clay, compacted or has poor drainage, make the hole three times the rootball's width and two-thirds as deep as the rootball. Water your dogwood every day for two to three weeks after planting, then twice a week for another year. Once established, water once a week for trees in full sun, but only during extended drought for trees in partial shade.